I wonder how many extra DVDs Lionsgate still has. The old toon DVDs sold very well, so they must have produced millions of discs. There are a dozen fan artists who would have given them better artwork than that... for free. I'm not buying this because I have no interest in it. But the box art certainly isn't helping. It frustrates me when companies do this, because it wouldn't cost them any more money to get a competently produced piece of art. There are fans who are also pros who could give them an on-model, beautifully-rendered digital painting for nothing more than what they paid for this. They must be using some in-house employee or a friend of an executive or something. I can't really complain about the box art. It's certainly not creative and the revamped cover doesn't look as good as the original art did. But it's a whole lot better than the terrible traced over 4Kids poses we had on the first release of Volumes 3-6. Volume 4 was the absolute worst as it was just a cropped shot of Donatello's face from the Volume 3 cover. I won't be surprised if Lionsgate keeps releasing revised DVD collections like this, or as the years pass more "bonus features" (more interviews, how to draw the Turtles tutorial with an animator, maybe even audio commentaries on some episodes, etc.) just so they can get consumers to buy more "exclusive" features. These DVD companies are somewhat notorious for that in which they will release the bare minimum for a movie or TV series in the beginning, but as the years pass by, they will slowly add more features and bonus material to try to entice consumers to buy the newly released DVD again. It's smart from a business perspective, but frustrating for a big fan who feels compelled to shell out money every time. As for the box art... yeah, it can be better. While the skyscraper background looks good and the action scene is okay, the Turtles themselves are disappointing especially Raphael's weird smirk/smile and Donatello's eyes/face with that bandana. Last edited by Refractive Reflections; 05-02-2013 at 10:16 PM. I think the only reason Lionsgate is continuing releases is simply because Nick must be badgering them to buy the series. There should be no doubt in anyones mind that Nick REALLY wants to own the episodes of the original cartoon. I think if they offer a high amount price Lionsgate will finally sell the rights over to them. It'll be for the best too. Nick might air the original toon on their block and might get better DVD releases. I won't be getting this nor did I get the recently released complete series because they released them after I had chronologically purchased each DVD they released over the years so I already have the complete series on DVD, maybe I would have got the complete series Turtle Van box set but from what I've heard they're the same exact discs and not in order so why bother? Why is everyone complaining about the artwork for this release? The show has been off the air for 17 years, do you really think they're gonna come up with something totally new? Sure it's a replica of the artwork on the "Hot Rodding Teenagers" VHS, but it is still way better than any of the artwork they used for previous DVDs. On this DVD cover they actually look like the OT Turtles because they took it straight from the vintage VHS artwork. This is what they should of done in the first place instead of using 2K3 art for OT DVDs. I would have preferred they use the exact same VHS artwork for all the DVDs there was so much potential. The original VHS artwork was awesome. On the first DVD they released, the artwork is pretty good like it's drawn to represent the OT, the turtles look like the toon turtles the background is very OT, and on the back it has Splinter looking just as he does in the OT, and it's based on a scene in the first season. I never understood why after the first DVD they started using the 2K3 art. I guess it makes enough since to sell it this way for future buyers, even if people don't buy it again. I've never seen the complete set in a store. I think some of us fan artists need to start making spoofs of Lionsgate crap-art. There could be some really fun possibilities. Heh, I haven't ever even tried to use photoshop so I guess they've got a leg up on me. 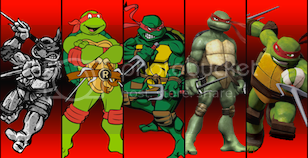 I do like the color shading on the turtles' skins though. Actually, for those of us not intending to track down a turtle van complete set, this is a cool release. I always hated the way LG did those early releases. With this release they still have weird disc inclusion issues, but at least there's a dedicated set for each season. I know it may sound crazy for me to double dip but you're looking at a dude that bought season 7 twice so my shelf wouldn't be as cluttered. I will def be picking this up. Even though I already bought all of the season sets before, I personally saw fit to get the complete series set for the simple fact that it came with a booklet that tells you what episodes are on each disc. Not all of the backs of the casings of the individual season sets had the episodes listed. I don't regret buying it, but they could have done better with the casing. I didn't pic up season three when int came out in pieces a few years ago, so this is good for me. Lionsgate: Re-release the complete series set and we will be eternally grateful. Damn you Lionsgate!!!! I'll probably end up getting this too! They should have totally released this a long time ago, especially before the Turtle-Van box-set! It drives me crazy that the episodes are still not completely in chronological order... Watch them release a second complete box-set eventually in the form of a play-set or something to make up for it. Stopped by Wal-Mart today and found TMNT season 3 on the rack. Only one store near me had them. Thought they were supposed to release July 23.
could be a mistake on Wal-Mart's part. A nice mistake though. I'm only one state away from you so I think I'll have to see if Walmarts around here have them out too. Thanks for the heads up! Hope you find one. Also it rang up $14.99 and not $19 as listed.